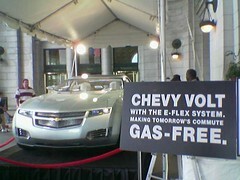 A new ‘Chevy Volt’ on display at Union Station. I gather from the name that it’s an electric car of some sort. Update: Volt. It’s just a concept model for a plug-in hybrid with limited electric range, and is only partly “gas-free.” Bah.